Build leg strength with a Floor Bridge. Lie down on your back, bend both knees with your feet flat on the floor. Squeeze your glutes, press through your heels and then lift your hips straight up about six inches. Pause for one second, then slowly lower. Begin with 10 reps. Stretch your leg muscles with this Lunge Stretch: Begin kneeling on your right knee, with your left foot forward and flat. Place one hand on the floor on either side of your body for support, or place your hands on your hips. Let both hips fall forward, feeling a slight stretch in the front of your right hip and thigh. For more of a stretch lift your right knee up about two-three inches off of the floor. Hold for 10-30 seconds, then release. Repeat the stretch kneeling on your left knee, and your right foot forward and flat. Add an Exercise Band to your Lunge! Hold both ends of the exercise band securely with each hand. Place your right foot on top of the band, so the band is securely under your arch. Step back with your left foot about 3 feet, so your right knee is directly over your right ankle. 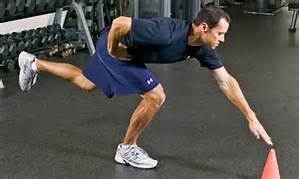 Bend both arms and hold the band into your body. Next, bend both knees and lower your body down toward the floor 10-12 inches. Straighten both knees to complete one rep. Do 10-12 reps with your right leg forward. To release, straight both arms and bend forward to put slack on the band, then carefully step off of the band. Repeat placing your left foot on the band. *This exercise is for intermediate/advanced exercisers without injury considerations. **Consult your physician before performing exercise.